by Brianna Crandall — June 22, 2018 — Humanscale celebrated last week’s NeoCon 50 contract furnishings show in Chicago with an array of products and programming that underscore its position as a pioneer of inventive furniture design for the workspace and beyond. The showroom highlighted Humanscale’s leadership in ergonomics, healthy materials and high-performance design, from the Niels Diffrient line of seating to new introductions in seating, lighting and monitor arms. The company’s monitor arms and task lighting each garnered Silver awards in the prestigious Best of NeoCon Competition. The award winners are highlighted below; watch for another FMLink article showcasing the company’s ergonomic and environmental seating innovations. Humanscale introduced a redesign of its best-selling line of monitor arms, M2.1, M8.1 and M10 to accommodate changes in how we work with technology today, creating more adaptable, personalized workspaces. 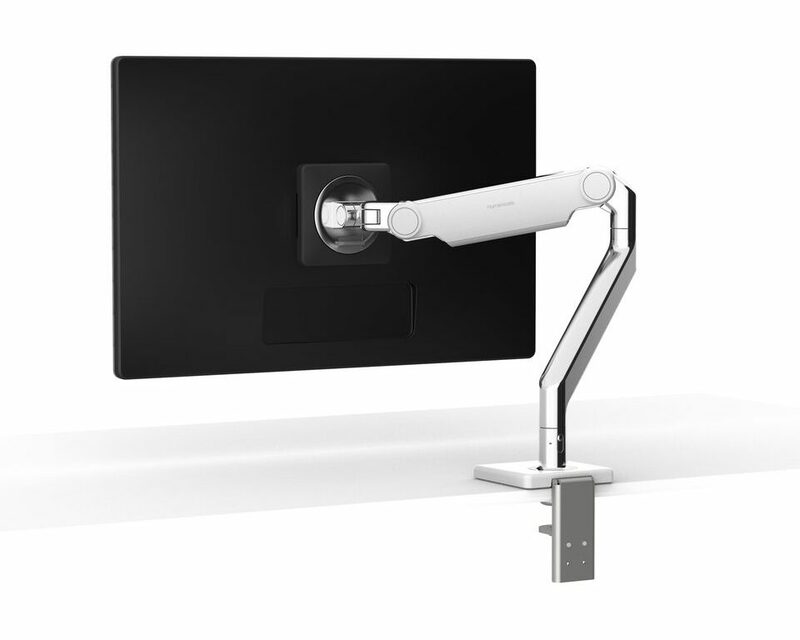 An essential tool for smart offices, monitor arms promote healthier postures for computer users, helping to reduce neck and eye strain, while increasing usable desk surface and eliminating clutter. As the workplace continues to become more agile, with hot-desking, shared desks and co-working spaces on the rise, M2.1, M8.1 and M10 are designed to optimize the user experience with intuitive functionality, precise positioning and smooth movement — allowing computer users to instantly personalize their work areas and be more comfortable, healthy and productive. Winning Best of NeoCon Silver in the Furniture Systems and Enhancements category, M2.1, M8.1 and M10 are engineered to meet a variety of configuration needs, from traditional desks to sit/stand workstations, and offer the unique ability to customize the arm style to suit any application. A patented weight-compensating spring technology ensures simple, fluid range of motion and supports monitors up to 48 pounds. The new monitor arms also utilize a precision-bearing technology that provides effortless depth adjustment, a critical ergonomic factor that affects eye-muscle fatigue. 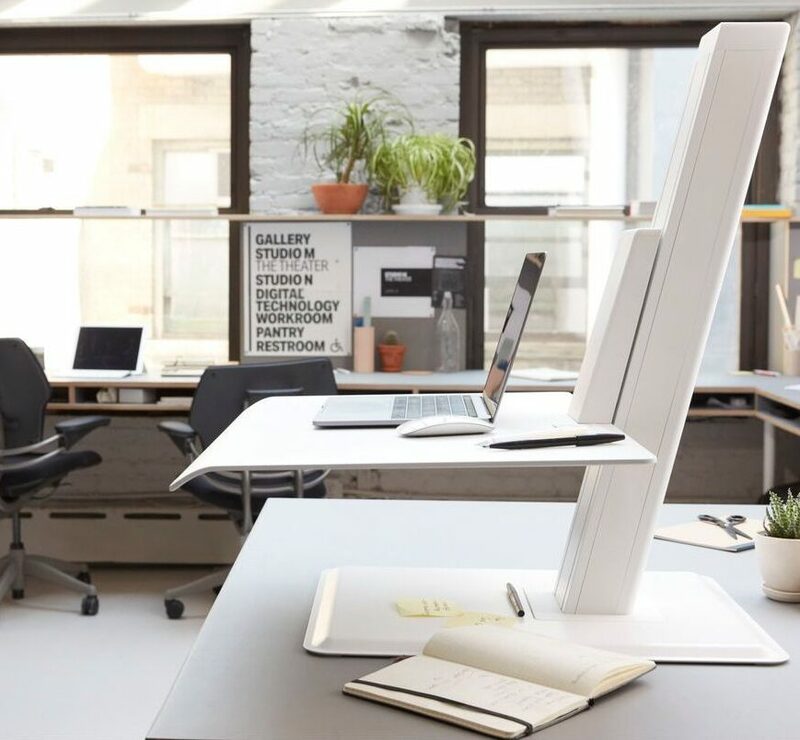 For added functionality, Humanscale introduced Smart Stop technology, which provides the ability to stop the arm and monitor anywhere along its rotation to protect equipment and employees and to prevent monitor or arm overhang on desk edges. An improved accessories bracket offers additional utility capabilities such as a document or headphone holder, and brackets for single monitors now include a handle for effortless adjustment with just one hand. With a sleek design born of function and simplicity, Humanscale’s new monitor arms immediately transform even the most outdated workspaces into customizable, ergonomic spaces that promote performance and productivity. All Humanscale monitor arms offer a full cable management solution, which removes unsightly wires from the desktop area, neatly organizing and incorporating them into the length of the arm. By integrating M/Connect, Humanscale’s USB docking station, into the base of the arm, users can connect their laptops to their monitors and other devices while eliminating all cables from the desktop via Split Dock technology. This creates an uncluttered and spacious work area with immediate access to ports for data, charging and audio. together instantly for a secure, robust fit, and a new built-in Counterbalance Indicator eliminates the necessity of an information technology (IT) team to assist with the installation process. Like all Humanscale solutions, the new monitor arms are engineered to last for years to come. For more information about the Humanscale monitor arms, visit the company’s website. 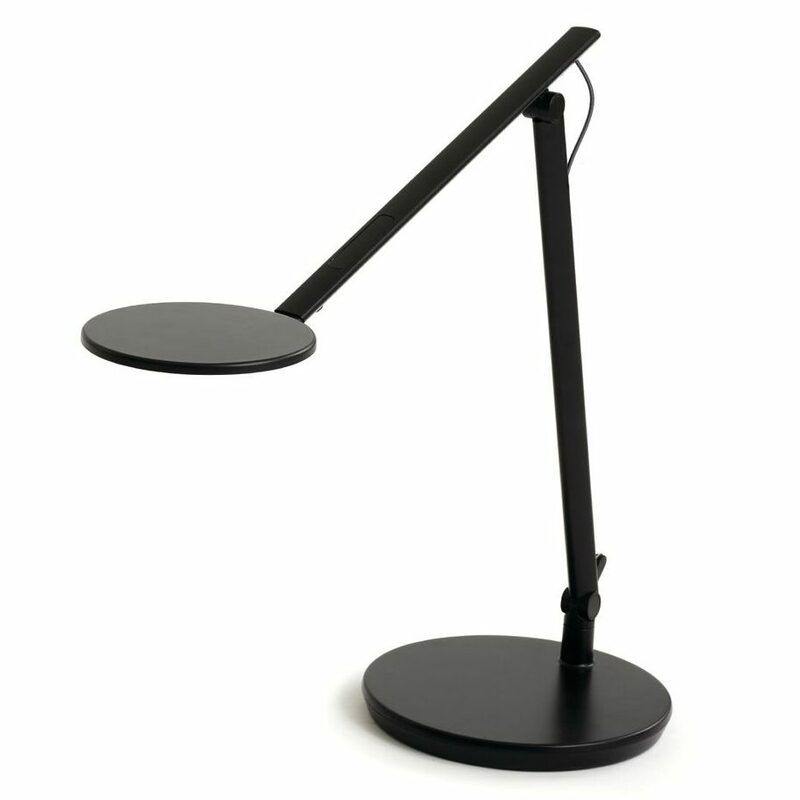 Humanscale also introduced two new task lights to its portfolio, Nova and Horizon 2.0. Utilizing advanced light-emitting diode (LED) technology for optimal light output and cost-saving energy efficiency, both task lights offer a smarter choice for offices and the environment, with performance and personalized precision and simple, clean aesthetics. Nova and Horizon 2.0 are designed to reduce eye strain and improve overall comfort by providing glare-free light that intuitively adjusts for a range of activities, from reading documents to writing emails, and everything in between. With these new additions that enhance ergonomic health and productivity, Humanscale continues to demonstrate its leadership and advance the task lighting category forward. While natural light in the workplace is widely recognized as a positive influence on productivity, creativity, and mood by optimizing inner circadian rhythms, it’s just one of many light sources needed to fully address well-being, says Humanscale. Today, with a multitude of backlit screens and the rise of open floor plans, task lighting, as a supplement to natural or overhead lighting, has never been more important for the optimal employee experience. Designed to complement any worksurface and enhance any workstyle, the new Nova task light offers “endless” adaptability in a striking, sculptural form. Featuring a custom lens and a large-array multi-chip LED, Nova creates soft, glare-free light. This inventive ergonomic design protects the eyes against strain, faithfully renders colors, and produces a single shadow on a work surface. Offering effortless, precise control, Nova brightens and dims with the touch of a finger. Its responsive counterbalance arms swing in 180 degrees, while its “revolutionary” Forever Hinge ensure the light’s position remains secure. Best of NeoCon Silver winner in the Lighting: Desktop/Task, Furniture-Integrated category, the sustainably engineered Nova task light received Energy-Star certification and contributes to LEED, WELL and Living Building Challenge standards. Its advanced occupancy sensors, which recognize a lack of movement, automatically shut off the light to conserve energy and costs. Responding to current needs for smart, energy-efficient lighting with a timeless aesthetic, Nova is designed to perform for many years. Nova is available in two sizes and three colors: black, gray and white. Improving upon the prestigious Red Dot Award winning design from Michael McCoy and Peter Stasis, Humanscale’s Horizon 2.0 implements the latest LED technology to produce its signature ultra-thin plane of light with greater efficiency. Committed to using only healthy, sustainable materials, Humanscale’s Horizon 2.0 uses thermoplastic polyurethane (TPU) material, a polyvinyl chloride (PVC) alternative, in its power supply. At the base of the task light, a seamless touch interface offers more precise control to adjust brightness. As a result, Horizon 2.0 features a cleaner overall aesthetic to complement its elegant, slim base, says Humanscale. The company says this next-generation design raises the bar for task lighting and will no doubt inspire like its predecessor, a feature in the permanent collection at the Museum of Modern Art (MoMA). Horizon 2.0 is available in six vibrant colors. 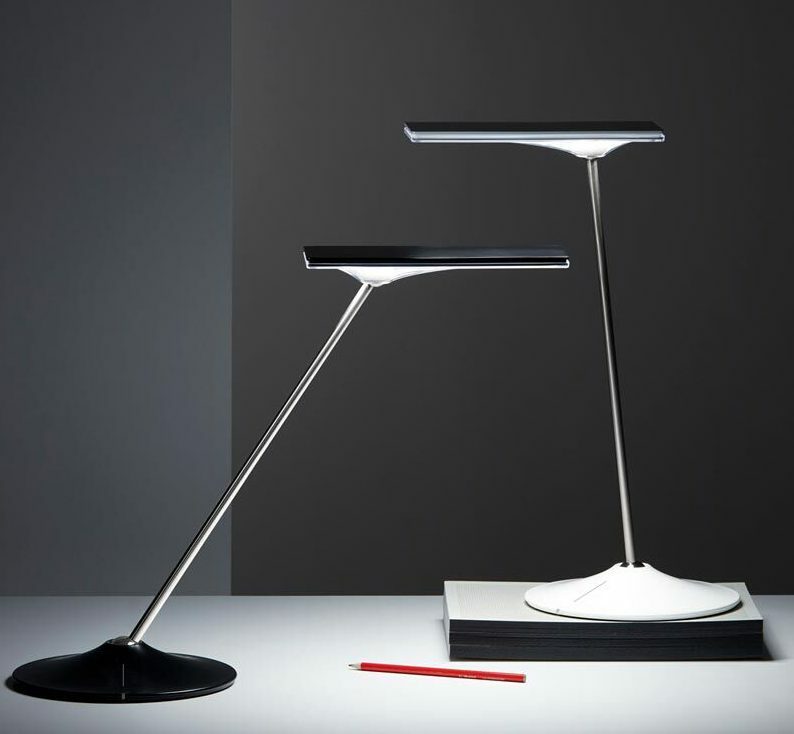 For more information about the Humanscale task lighting, visit the company’s website. Humanscale’s QuickStand Eco adjustable desktop riser also won a HiP award in the Health & Wellness: Furniture category at NeoCon.